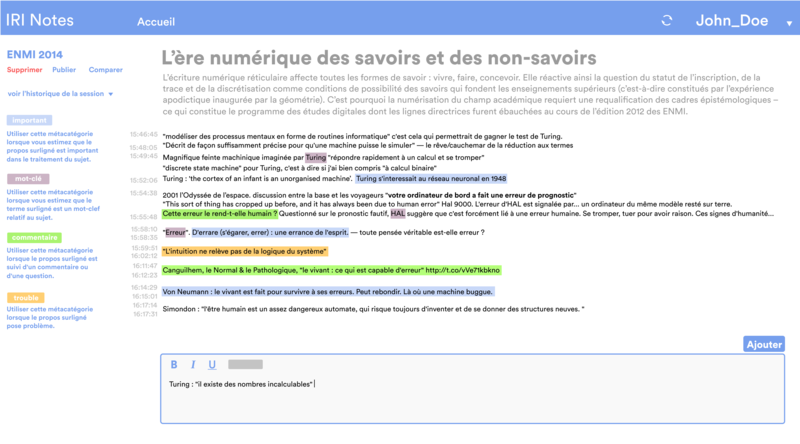 IRI Notes is a temporalized note-taking tool. It allows a student or a group of students to take notes during a recorded course, whether face-to-face or remotely. Once the note-taking is done, the student can clean up his notes and ask for their synchronization to the video recording. The perspective is then reversed: the notes become the annotations or « footnotes » of the video recording. 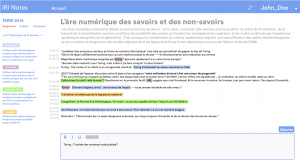 In the context of working groups, several students can visualize everyone’s note-taking and / or design common editorialisations: reports with links to selected time-codes of the recording, summaries, clickable tables of contents, indexes, glossaries, etc.